Management consulting firms operate in various fields from business strategy to technological renovation, from human capital to change management, accounting or marketing. Each aspect has its own demands, but some requirements stay universal. Accelerated performance is achieved through rapid data transfer, automation, optimized resource management and unified document flow. In this regard, a professional CRM for consulting companies is a valuable instrument to create a centralized collective knowledge environment, which makes client―customer relations transparent, simplifies data access and provides an easy-to-use database for agents. While the market of CRM products is constantly expanding, there are several software tools, which have deserved their wide acclaim among thousands of consultants. This overview of five professional CRMs specifically designed for consulting firms will give you an insight into capabilities of modern digital environments and provide several options to implement or to migrate to. Among other industry-specific solutions bpm’online family of products features a CRM environment developed with regard to requirements of management consulting companies. In a word, their CRM for consultants serves as a self-sufficient digital umbrella, which covers management of resources, human capital, documents, enquiries, sales & marketing and business processes. With the adoption of the bpm’online CRM, all these activities get a much higher degree of transparency and flexibility. Process-driven layout turns the daily workflow into a clear-cut sequence of simple operations many of which can be fully automated. Ability to access all data from one place and get instant help from co-workers translates into increased productivity and discipline. Project managers will benefit from automatic calculation of service costs, sophisticated workload planning and ready-to use analytics. For human resource department there are tools to supervise the professional growth of employees, while salespeople are provided with full-cycle sales funnel support ― from lead acquisition to analyzing financial results. Bpm’online consulting CRM is just so all-encompassing and customization-friendly that it renders separate department-specific apps excessive. The unified informational environment eliminates double handling of client data when progressing them to another department, streamlines cooperation and combats redundant administrative routine. What is more, it will seamlessly integrate with popular business tools, thus allowing for rapid implementation. And adoption of the system is greatly facilitated with its intuitive UI and decent knowledge base of manuals, webinars and video tutorials. Another leader of CRMs for consulting firms, Accelo, offers a robust set of tools for workflow automation, resource management and tracking. It prevents employees from wasting time on switching between different platforms as almost anything a consultant needs is available in a single place. Accelo team is perfectly aware that time is money, so they have equipped their platform with a wide array of tools to track, report and bill consulting activities. This CRM will prevent any effort from going unbilled, thus maximizing revenues. An excellent range of third-party integrations lets employees work in their habitual environments, while its module-based environment makes Accello able to grow as your business expands. On the downside, this consulting CRM would benefit from a cleaner interface, less crammed with various tabs and buttons. Some users find that the reporting section lacks customizability, although developers are planning to amend these problems in the next release. Insightly positions itself as a versatile CRM platform suitable for any business, including sales management consulting firms, IT consultants and many others. Apart from basic CRM features like contact database, automated notifications and well-developed reporting, Insightly offers powerful tools for project management. It’s possible to create and assign tasks, get real-time reports on task fulfillment and link any files associated with the ongoing projects. Tracking capabilities of the system ensure excellent control over the client progression between departments, while customer interaction history fosters transparency at any stage of a workflow. With its clean, visual interface Insightly is praised for its usability, although consistency between different modules isn’t perfect ― you can’t view the all the information you have on a contact without opening additional screens. And as the CRM is designed for less experience users ― which does simplify implementation ― some features (e.g. reporting customization and security options) still need some honing. 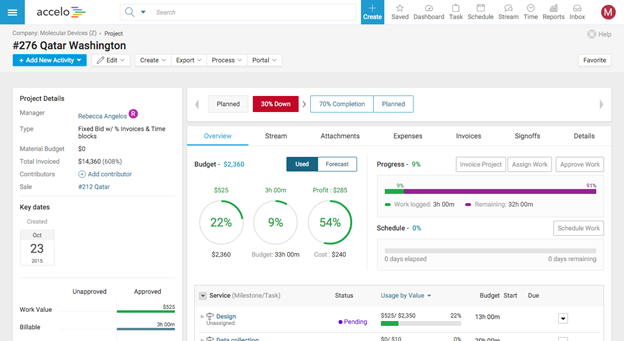 Not exactly a consulting CRM, BillQuick nevertheless covers maybe the most crucial aspects of any consulting business: time management, billing and accounting. BillQuick offers robust time management capabilities at all levels from a single employee, to the entire company. Tracking of expenses in multiple currencies lets you know exactly how much funding your current project consumes, while detailed reporting helps to stay on top of profits and losses. Another strong side of BillQuick is project management. The centralized environment allows to assign tasks, allocate resources and easily manage and forecast workloads. With added transparency and streamline decision-making, it allows for a considerable boost of key business indices. Billing and accounting options are highly diverse. Routine processes can be automated to negate human errors, while billing wizards and sophisticated invoice management greatly enhances productivity of your accountants. All in all, it is a fairly versatile tool to keep time, resources and money in check. Available in both cloud and on-premises versions, RationalPlan is a good choice for management consulting firms, seeking to organize their project management procedures. RationalPlan grants you total control over all the project stages through well-though reporting and analytics options. Tracking work progress and funneling resources to where they are needed let your company take full advantage of available potential. RationPlan is simple to use and offers features specifically designed for efficient project management, while convenient commenting and notification fosters collaboration. Highly customizable user access to documents and shared data prevents unsanctioned changes and sophisticated cost tracking system helps to optimize expenses.